Dylan Strome didn't plan to be here. Team Canada's captain at the world junior hockey championship imagined he'd be playing for the NHL's Arizona Coyotes right now. Dylan Strome didn't plan to be here. Team Canada's captain at the world junior hockey championship imagined he'd be playing for the NHL's Arizona Coyotes right now. But just over a month ago, after spot duty with the club that drafted him third overall in 2015, Strome was sent back to the Ontario Hockey League. The 19-year-old, who said he felt "done with junior hockey" in July, was suddenly back there once more. "It's something that I've obviously never really done before," Strome said of the experience of having to return to the Erie Otters for a fourth season. "It's kind of just weird coming back to a situation that I've been in for three years. It's not really weird, but at the same time it is just because you haven't been there." Arizona opted to return Strome to Erie on Nov. 20 after he was made a healthy scratch for the 10th time. His inclusion in head coach Dave Tippett's lineup was sporadic. He played in only seven games in just over a month with the Coyotes, registering a single assist. It was the kind of thing Strome, always among the best players on his teams growing up, had never experienced before. Suddenly he wasn't an automatic for the first or second line or a shoo-in to run the power play. Strome detailed the lesson of the experience with great detail. "You've got to live every day like it's going to be your last one there," he said. "You've got to work hard. Nothing's given to you. You don't know when you're going to be in the lineup. You go to the rink every day hoping your name's on the board and if it's not you've got to work extra hard to get there." Strome said he gained newfound respect for those players who struggle to get into the lineup on a regular basis, whether in the NHL or junior. He got a genuine sense of what it's like to show up at the rink every day and not know whether you were playing or not, an uncertain feeling indeed. He won't have that problem on Team Canada where he'll earn top billing right from Day 1 with some of the country's most exciting talents, including Connor McDavid and Mitch Marner, in the NHL while others, such as Nolan Patrick, the likely No. 1 overall pick in 2017, are sidelined by injury. That leaves a void for someone like Strome to emerge and help solve a gold medal dry spell — one in seven years — broken only in 2015 by a McDavid-led squad. "It's pressure for Canadians, but it's good pressure," said Strome. "You want to be the guy. You want to be the next [Jordan] Eberle. You want to be the guy that scores the goal or be on the team [that wins]. I know many Canadians can remember pretty much player that's been on every gold-medal winning team." Strome posted six points in five games for Canada's disappointing sixth-place finisher last year in Finland. Unlike then, when he was tearing up the OHL upon joining Team Canada, Strome says he's still trying to reach high gear after the wobbly NHL experience, which included coast-to-coast travel he'd never experienced before. 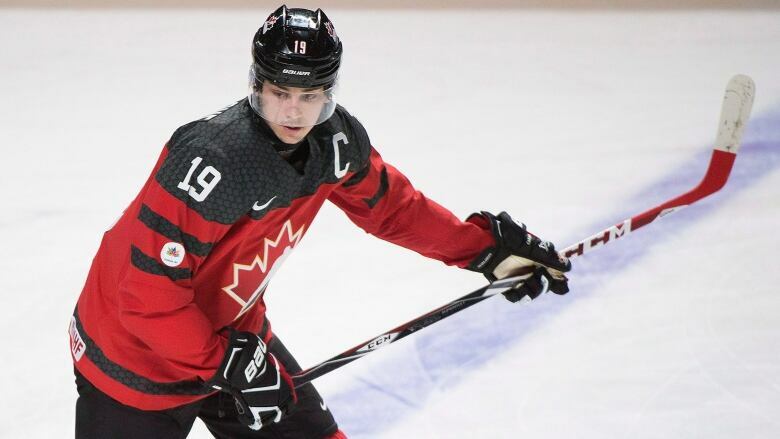 Strome posted 16 points in seven games with Erie upon returning from Arizona and will try to make a similar dent for the Canadians, shut out of the medal conversation in three of the past four world junior tournaments. The lanky six-foot-three, 185-pounder is pegged to centre the nation's No. 1 line, joining Mitchell Stephens and Pierre-Luc Dubois, the No. 3 overall pick of the 2016 draft. Beyond just national pride and restoring order to a Canadian program that racked up five straight golds at one point last decade, Strome has the added motivation of injecting some light onto a season that's not gone as he would have liked. The Coyotes will be watching too and though seven games won't make a season "obviously this tournament means a lot". "It's against better competition than junior and they want to see what you got," Strome said.